Synthetic Aperture Radar Doppler Anomaly Detected During the 2010 Merapi Eruption. 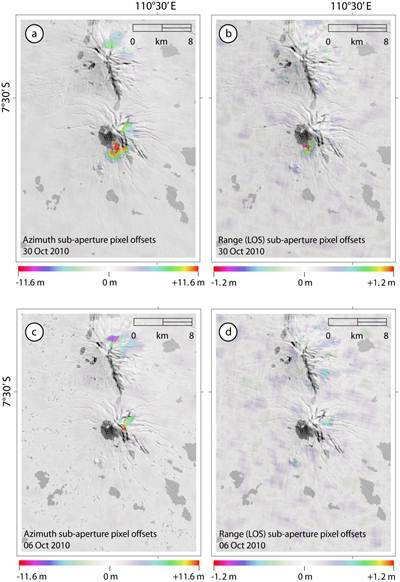 In this study we report the presence of a localized Doppler anomaly occurring during the focusing of a Radarsat-2 dataset acquired on the Merapi volcano (Indonesia) during the devastating 2010 eruption. The Doppler anomaly is manifested as a ~3km wide bull-eye shape azimuth pixels shifts between two sub-aperture images. The Doppler anomaly is centered on the summit-south flank of the Merapi volcano. The pixel shifts reaches up to 11.6 meters. Since the Merapi volcano was undergoing a large eruption during the data acquisition, it is possible that there is a volcano-related phenomenon that has delayed the radar signal so much to create measurable pixel offsets within a single SAR dataset, similar -but having more extensive area- to the signal generated by targets motions; similar -but having less extensive area- to the signal generated by ionospheric perturbations. It is known that the SAR signal is delayed as it passes through heterogeneous layers of the atmosphere, but this delay typically affects the SAR signal to a fraction of the phase cycle or few centimeters depending on the radar wavelength employed by the system. We investigate the source of this anomalous metric signal; we review the theoretical basis of SAR image focusing and we try to provide a consistent physical framework to our observations. Our results are compatible with the SAR signal being perturbed during the actual process of image focusing by the presence of a contrasting medium located approximately between 6 and 12 km altitude, which we propose being associated with the presence volcanic plume.